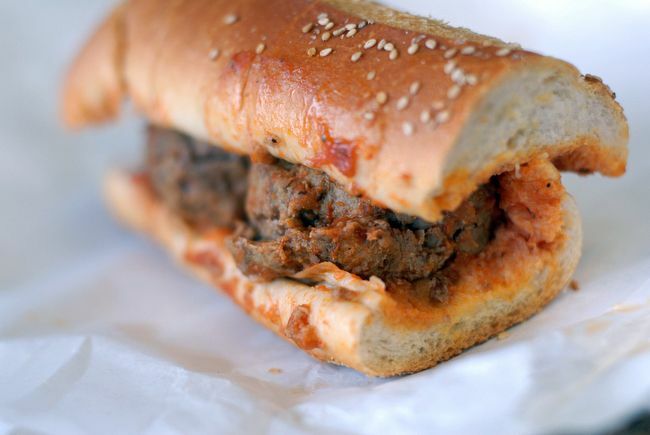 Defonte’s is a classic Italian deli in Red Hook known for its hot roast beef heros, massive sandwiches and delicious hot lunches (a favorite with police and firemen) and house-made mozzarella, but we are prone to the meatball sandwich, which, though large, is hard to put down after one starts eating. The meatballs are … just … divine. The deli is run by Nick Defonte, who’s dad, Nick, left Mola di Bari, Italy and worked on “the railroad, labored at a coconut factory, loaded trucks and took any job he could find,” according to Defonte’s website. He then got a job on the Red Hook docks as a longshoreman. A man named “Brooklyn,” approached Defonte and asked if he’d like to buy the shop – where men would play cards and drink coffee waiting to get jobs on the docks – for $100. And that’s where it all started. Defonte’s recently opened Defonte’s of Brooklyn in Manhattan, on 3rd Ave. and 21st St.
379 Columbia St., just over the highway at Commerce St.
*This is a sponsored post. Defonte’s provided sandwiches to the South Brooklyn Post holiday party in December, and they were delicious! Thanks Defonte’s.